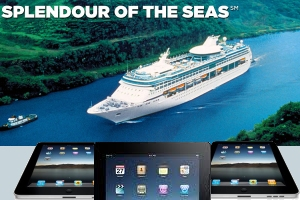 Royal Caribbean International will mark another industry first with the introduction of iPad mobile digital devices in every stateroom onboard the newly revitalized Splendour of the Seas. The device will give guests an additional medium by which to receive, retrieve and use information on their cruise vacation. 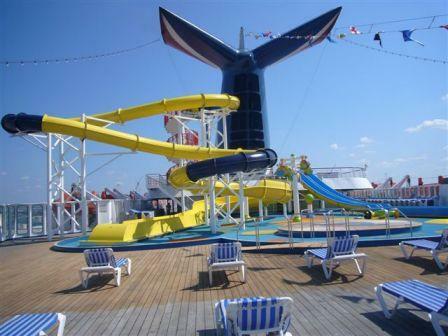 With a touch of the screen, guests will be able to access the daily Cruise Compass of events and activities; personal daily itineraries, including shore excursions; monitor their onboard account; order room service; view restaurant menus; access the Internet; and watch movies. The iPads will be available beginning mid-February 2012 on Splendour of the Seas before being extended to all Vision-class ships when each undergoes revitalization in the following two years. In addition to the iPads, Splendour of the Seas, which recently emerged from dry dock, also boasts an array of new stateroom amenities such as flat screen televisions, new bathrooms and completely remodelled interiors. The newly revitalized Splendour will also debut new dining options including the Asian Izumi restaurant; the line’s signature steakhouse, Chops Grille; the Boardwalk Dog House hotdog counter; the Park Café deli-style restaurant; and the exclusive Chef’s Table dining experience.